In any case the presenter has a predilection for what used to be called “Soul”, “Deep Soul” “Blues” and that much maligned term “R&B”. 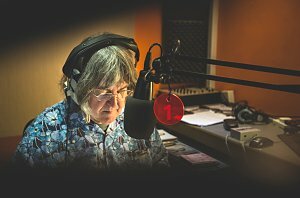 The show also features fusion, electronica, nu-jazz and whatever other new categories emerge to try and define “Jazz” Without apology the show is about what the presenter wants to hear and listen to, and perhaps most of all, enjoy! Dave Treharne (aka. Dr David Treharne) has been broadcasting since 1984 playing either blues or jazz on stations as diverse as DevonAir, Gemini, Jazz FM and what is now KSSJ Sacramento. After working as a University Lecturer he then became Chair of Exeter City AFC, a fans owned soccer club, and then of Phonic.fm. He is a voracious collector of music with a vinyl and CD collection of epic proportions.